The National Issues Committee (NIC), which is made up of the three Welsh Fire and Rescue Authorities and Services was recognised for its outstanding change and leadership at the All Wales Continuous Improvement Community National Conference 2014 and its inaugural awards ceremony held at the SWALEC stadium in Cardiff. The NIC had been shortlisted with both Monmouthshire and Pembrokeshire County Councils’ Children’s Services. Professor Catherine Farrell, from the University of South Wales presented the ‘Outstanding Change Leadership’ award to the NIC. The award recognises the exceptional collaborative work of the NIC with regards to excellence in leadership, demonstrating vision and strategic leadership. 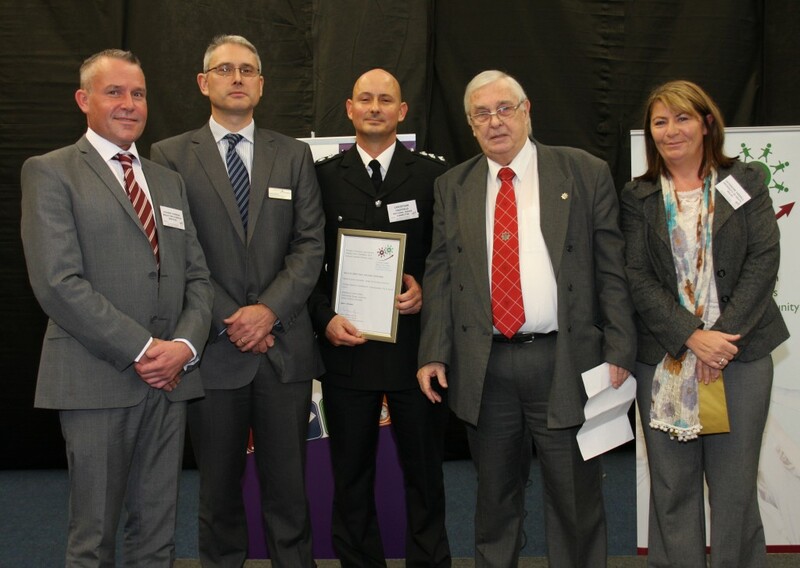 Councillor Tudor Davies (Chair of the NIC) accompanied by Assistant Chief Fire Officers Richard Fairhead of North Wales Fire and Rescue Service, Derek Masson of Mid and West Wales Fire and Rescue Service and the NIC Programme Coordinator Christian Hadfield received the award . Huw Jakeway, Chief Fire Officer for South Wales Fire and Rescue Service said, “The National Issues Committee builds on a proud history of collaboration between the three Fire and Rescue Services in Wales. This approach ensures that as a Committee we are able to maximise opportunities to continuously improve service delivery across Wales so that we can continue to effectively serve our communities. The All Wales Continuous Improvement Community National Conference celebrated the significant amount of continuous improvement which takes place within public sector organisations across Wales. The event highlighted that a vast array of innovative and creative methodologies are being used to improve the services delivered to our communities across Wales on a daily basis. The 200 attendees were from a broad cross-section of Welsh public sector services.